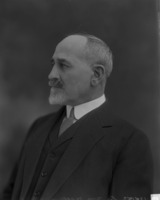 BURK, DANIEL FRANCIS, business promoter and politician; b. 25 Dec. 1848 in Darlington Township, Upper Canada, son of William Knowles Burk and Clara Coryell; m. first 23 Oct. 1873 Annabella Ida Gerrie in Whitby, Ont., and they had two sons and six daughters; m. secondly 11 April 1917 Evangeline Medora Anderson in St Augustine, Fla; d. 29 Sept. 1917 in Port Arthur (Thunder Bay), Ont. The eldest son of a reeve of Bowmanville, Upper Canada, Daniel Francis Burk was educated in the public and high schools of that town. He joined the Ontario Bank in nearby Whitby in 1867. In 1875, at age 26, he succeeded William Beith as manager of its Port Arthur branch, Thunder Bay’s only chartered bank until 1890. 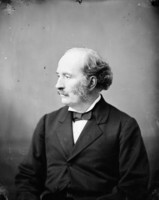 He resigned in 1884 to pursue his own plans and to become financial manager for his brother Marvin, a contractor for the Canadian Pacific Railway. A continentalist and strong supporter of unrestricted reciprocity with the United States, Burk understood the linkages between business and politics. As Liberal candidate for the federal riding of Algoma, he would run vigorous but unsuccessful campaigns against Simon James Dawson* in 1887 and George Hugh Macdonell in 1891. He was to serve as a Port Arthur town councillor for ten years (1894–1901, 1909–10). By nature a boomer, Burk took up promoting colonization railways such as the Port Arthur, Duluth and Western Railway (incorporated 1883, built 1889–92) and the Ontario and Rainy River Railway (incorporated 1886), both of which were rescued from failure when William Mackenzie* and Donald Mann* acquired control of them in 1897. Even less successful promotions undertaken by Burk were the stillborn British Canadian Bank (1886) and the chimerical Thunder Bay, Nipigon and St Joe Railway (incorporated 1899). With the political support of fellow Liberal James Conmee, the mla for Algoma West, Burk lobbied tirelessly for provincial and federal subsidies. The two men were frequently involved in the same companies, among them the Port Arthur Water, Light and Power Company and the Port Arthur Herald Printing Company, whose acquisition in 1892 gave them a vehicle for publicizing their schemes. Burk had the pleasure of seizing, in 1895, and eventually selling the plant of his long-time critic the Thunder Bay Sentinel. The West Algoma Agricultural Society, of which he was a founder (farming was his hobby), and the New Ontario Industrial Exhibition, for which he secured fairgrounds, became avenues for advertising northern products. From the beginning of the society about 1886, Burk hauled off vegetable and mineral exhibits to the Toronto Industrial Exhibition and wrote back glowing reports to the local newspaper about how well the products were being received. Burk reached his apogee as a promoter in the late 1890s with the New Ontario Colonization Association, of which he was general manager. The Port Arthur News-Chronicle credited him with having coined the term “New Ontario,” which came to be applied to all of northern Ontario. The Toronto Evening Star dismissed as “a dream of the breezy west” his vision of expanding Ontario’s northern boundary to include the District of Keewatin or possibly creating a separate province. His delegations to eastern cities became legendary. Edward Saunders Rutledge, town clerk of Fort William (Thunder Bay), would later remember Burk “pinning up speckled trout skins at the King Edward [Hotel] in Toronto[,] . . . in Montreal with maps and advertising matter under his arm, coat flying, leading the party in Indian file through a narrow winding street to the office of La Presse.” The irrepressible Burk even named two of his daughters, Cara Algoma and Florence Algoma, after the Algoma District. Contemporaries had mixed opinions about ‘D. F.’ They admired his hustle and vision but found him impractical, blunt and opinionated, unperturbed by criticism, and, in later years, eccentric. Even his marital status was controversial. He had obtained a divorce in Illinois before marrying Mrs Anderson in Florida, but the Supreme Court of Ontario recognized neither the divorce nor the marriage. Following Burk’s death in 1917 from Bright’s disease, his children and – by Ontario law – his widow, Annabella, contested his will, which left most of his estate to his second wife, in a messy case that would not be settled until 1920. He had amassed a fortune in real estate, including the farm which became the Mariday and Ray Park subdivisions of Port Arthur. Still, in the view of the News-Chronicle, “he was the creator in his own mind of vast schemes which have yet to materialize.” At least two of his visions did come to fruition: the Canadian Lakehead Exhibition, which emerged from the West Algoma Agricultural Society, and Lakehead University on Oliver Road, which has origins in a real estate promotion launched by Burk. AO, RG 22-398, 1920, no.1078. NA, MG 26, G; MG 27, II, D15; RG 30, 1336; RG 31, C1, 1861, 1871, Bowmanville, Ont. ; 1881, Prince Arthur’s Landing [Port Arthur], Ont. ; 1891, 1901, Port Arthur. Daily Journal (Fort William [Thunder Bay], Ont. ), March, 12 May 1899, continued by Daily Times-Journal, 1 Oct. 1917, 23 Feb. 1937. News-Chronicle (Port Arthur [Thunder Bay]), 1 Oct. 1917. Weekly Herald and Algoma Miner (Port Arthur), 15 May 1896, 26 May 1899. Weekly Sentinel (Port Arthur), 4 Jan. 1889, 20 Dec. 1895. Canadian men and women of the time (Morgan; 1912). Newspaper reference book. Thunder Bay district, 1821–1892: a collection of documents, ed. and intro. [M.] E. Arthur (Toronto, 1973). T. J. Tronrud, Guardians of progress: boosters and boosterism in Thunder Bay, 1870–1914 (Thunder Bay, 1993). Who’s who and why, 1913. F. Brent Scollie, “BURK, DANIEL FRANCIS,” in Dictionary of Canadian Biography, vol. 14, University of Toronto/Université Laval, 2003–, accessed April 24, 2019, http://www.biographi.ca/en/bio/burk_daniel_francis_14E.html.